When in Pondicherry, you’ll want to be put up at Aadhaar Guest House, a centrally located property that overlooks the sea. Sounds great, right? We’ll sweeten the deal further! It’s only INR 800 a night! It’s been established time and time again that Pondicherry is one of the perfect getaway spots when you catch a nice break. With plenty to see and do, the former French settlement is perfect for a quick vacay and we know just where you should stay when you’re there…The Aadhaar Guest House. A nice home that overlooks the sea, it is just a short walk from the beach and has comfortable rooms for you to nestle in. 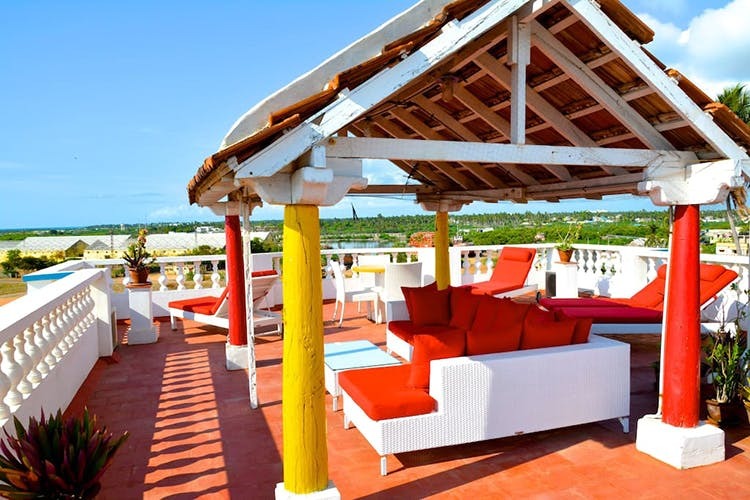 With a lovely terrace that has a hammock to laze around in, it’s perfect for whiling away time. They have an outdoor space with a vintage wooden swing too that you can perch, or beach chairs outdoor on to read a book in the balmy weather. Don't want to be a homebody? Rent out their cycles and wheel yourself around town, taking in the sights of Pondi along the way. A nice old-school home in Pondicherry, the house has spacious rooms, perfect for fam jams and vacay with the squad. With all your usual amenities like comfy beds, clean bathrooms and, of course, free wifi, it’s great for the price. We love the French windows, the ethnic touch of bed covers in a rather European set up, and old school lamps (none of that dramatic neon light here). What’s more, wake up to great views of the sea or the city. They also have a library, a dining area, and our favourite part, their terrace. You’ll experience the warm hospitality of Pondi and be well taken care of by the friendly staff there, who will also let you know what to see and do around the area And with the tariff priced at an easy INR 800 a night (which was the rate at the time this article was published) this sounds like a sweet deal. So what’re you waiting for? Book your tickets to Pondicherry right away.